Matrikon® DMZ Agent™ provides a secure, standardized solution for accessing real-time and archived control automation data across De-Militarized Zones (DMZs) using off the shelf MatrikonOPC products. Problem: Corporate IT departments implement DMZs to protect network assets by layering and isolating secure zones from those that are considered less secure. Network traffic is restricted between these layers via multiple firewalls and a common PC between them. While DMZs work to secure the automation environment from the dangers present in the outside world, they prevent necessary operations and business applications from accessing key data using traditional methods. Solution: DMZ Agent™ overcomes DMZ related control data sharing issues by providing engineers and system integrators with two time-tested OPC architectures depending on design and corporate security policies. 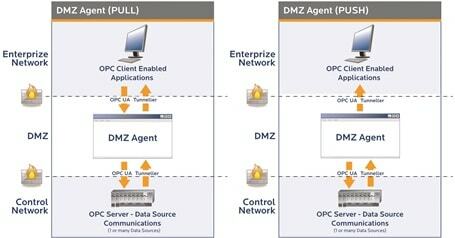 The DMZ Agent Pull solution enables permitted enterprise applications to securely initiate requests for OPC data located within a secure network. The DMZ Agent Push solution allows permitted enterprise applications to receive secure network data pushed from within a DMZ (one way firewall configuration). Streamlined architecture provides flexible configuration depending on data needs. Easy to use, requires minimal configuration and maintenance. Provides secure, controlled access to process data. Push architecture provides access to historical data. Pull architecture provides access to real time and/or historical data. Integrates with all historians and databases. Matrikon OPC UA Tunneller provides an intuitive, user-friendly interface to help you get your Classic-to-Classic OPC connectivity and Classic-to-OPC UA bridging up-and- running quickly and efficiently.. Learn more! MatrikonOPC Security Gateway secures all real-time OPC architectures. Unlike OPC solutions that rely only on DCOM security, Security Gateway controls who can browse, add, read and/or writesp; &nb to a tag on a per-user-per tag basis on any OPC DA server. Fully standards-based for maximum compatibility, the Security Gateway implements the OPC Foundation’s OPC Security specification. (ScheduleLink), or be triggered via some process variable (MonitorLink). Historical data management has never been easier. HistoryLink is also iC! Enabled, thus remote configuration is possible. Learn more! geographically remote sites. Learn more! The MatrikonOPC UA Proxy enables existing OPC Classic client applications to connect and communication with Unified Architecture (UA) servers and devices. This allows users to integrate emerging UA products into existing OPC Classic infrastructure. Learn more! The MatrikonOPC UA Wrapper for COM OPC Servers provides OPC UA clients with access to legacy COM OPC DA and HDA, OPC Servers using OPC UA Specifications. The UA Wrapper exposes COM OPC servers as folders in the OPC UA server’s address space. Learn more!